When it comes to picture windows, it’s not all about looks. Picture windows offer an unobstructed view because they’re made up of one large pane. As one might expect, these broad, sweeping windows offer a breathtaking view, which is a major draw for many homeowners. But there are plenty of other benefits to installing picture windows. Gorgeous in Green. Picture windows don’t only give you a great view of the landscape, they’re good for it, too. They let in more daylight, which limits the need for artificial lighting. Because picture windows are sealed around the edges, they’re insulated against air and moisture leaks. 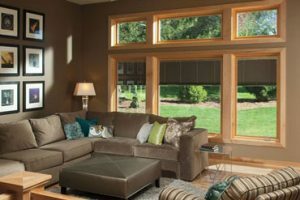 To increase the energy efficiency of picture windows, homeowners should look for windows with warm-edge spacers, low-e coatings, and other energy-saving options. Built to Last. A thick, solid pane of glass is much harder to break than smaller, reinforced panes, so picture windows are tougher than many window options. Because picture windows don’t have moving parts, you won’t need to pay to replace mechanical parts a few years down the line. This keeps both upkeep and long term costs to a minimum. What are the drawbacks of picture windows? Because picture windows cannot open, they need to be cleaned from the outside. Since picture windows are made of fixed parts, they don’t provide ventilation. In the rare event that the glass is damaged, the entire panel must be replaced. Does your house need window replacement? Picture windows can make your home look and feel larger. Call McCann Windows & Exteriors today and transform your home for summer.